Mayo Clinic leaders in information technology (IT), individualized medicine and cancer research yesterday recognized AT&T Foundation as a Principal Benefactor of Mayo Clinic and provided updates on Mayo's Enterprise Data Trust and its implications for advancements in disease diagnosis and treatment. Through its foundation, AT&T has contributed $3.4 million to support these efforts, including a $900,000 gift for Mayo Clinic IT infrastructure and $2.5 million for the Enterprise Data Trust, an essential component of Mayo’s Comprehensive Cancer Center. One of the key historic elements of Mayo's success was Dr. Henry Plummer's development in 1907 of the unit-based medical record, which (combined with the Mayo brothers' emphasis on teamwork) made the group practice of medicine possible. Instead of each physician keeping individual notebooks on patients, the notes from every specialist, and all of the lab readings, were combined into one record for each patient. That record followed the patient to each appointment, so every physician knew what colleagues had observed about the patient. In today's presentation, Scott Beck of Mayo Clinic's IT department (section head for Enterprise Data Warehousing) told how Mayo made the transition from a paper-based medical record to a chartless environment (from 1995 to 2004.) Now the Electronic Medical Record (EMR) enables capture of much more data, but instead of having the records stored in one physical warehouse, the data are in 1,200 separate databases. This complicates research because the data aren't all in one place, but it also opens enormous opportunities. 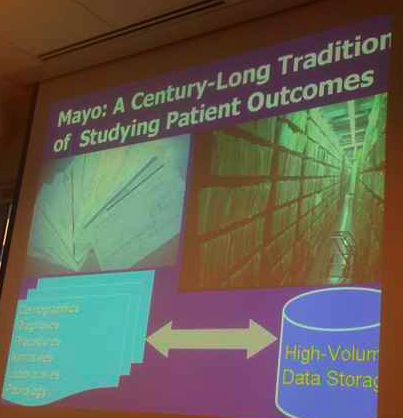 Mayo began its efforts with the Mayo Clinic Life Sciences System, a joint project with IBM that enables researchers to perform queries on large numbers of patients much more rapidly than was possible under the paper record system. Success with this initial work led to the establishment of an enterprise-based data warehouse, the Enterprise Data Trust (EDT). The EDT enables Mayo to store and analyze data from a wide variety of the various databases for purposes of supporting practice, education, research and administrative reporting and analytics. This has been helpful in demonstrating research productivity when Mayo Clinic received re-designation from National Cancer Institute as a comprehensive cancer center, and in securing additional research funding. For example, Dr. Eric Wieben, the Mayo leader for the Minnesota Partnership for Biotechnology and Medical Genomics, says the AT&T support helped research teams to have initial data that led to another $2.7 million in funding for genomics research projects. And Dr. Robert Diasio, director of Mayo Clinic Cancer Center, says it has helped in achieving approval for SPORE cancer grants, making Mayo one of a select few institutions with more than five SPOREs.